Beachside II 4359 is one of our guest's favorites. This 16th floor condo shares some of the most memorizing beach views you can imagine. From the moment you walk through the front door, you relax knowing you are in paradise. 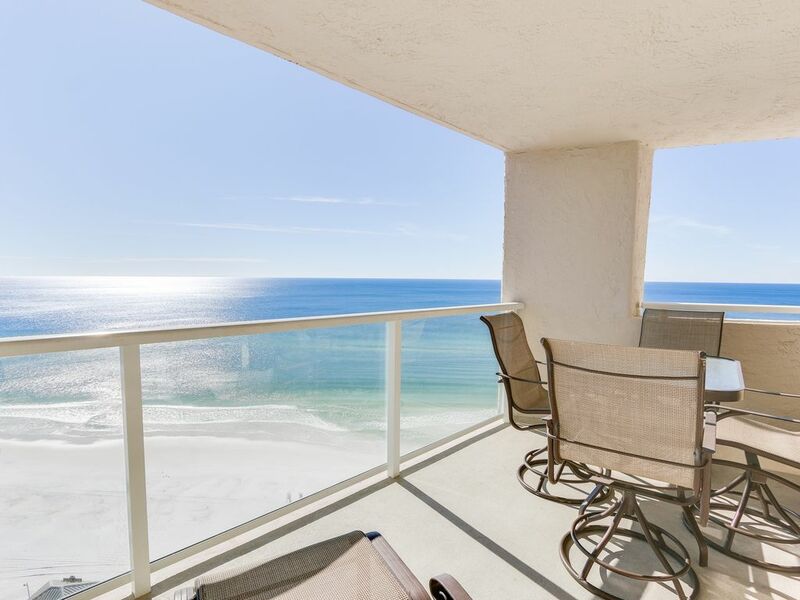 The 2 bedroom, 2 bathroom, 1100 sq ft condo, is perfect for all beach lovers - located near all the action in the Sandestin® Golf & Beach Resort. Your condo comes equipped with a spacious living space and flat screen TV; enjoy a beachfront balcony each morning while wathcing the mroning news. The dining area and breakfast bar comfortably seat 6. The fully stocked kitchen has everything that your family needs tor making dinner indoors - fridge, oven/stove, dishwasher, coffee maker, microwave and all the basic kitchen essentials: plates, drinkware, silverware, pots & pans, etc. Your master bedroom has its own private balcony, a comfy King bed, and a flat screen TV. The ensuite bathroom has vanity space and a shower/tub. On the other side of the condo you'll find your guest bedroom with two XL Twin beds, a TV, and adjoining guest bathroom with another shower/tub. There is also a washer/dryer in the property! - Our dedicated and hardworking housekeeping teams are some of the best along the Emerald Coast! * Snowbird winter rates can be provided upon request. Payment and cancellation policies differ. We are so sorry the weather was bad during your stay. Mother nature: she is unpredictable. We are also sorry that the two bedroom/two bath, didn't have a water heater large enough to cover 6 adults taking back to back showers. Maybe in the future you can call us, and we can have someone check your water heater settings, or we could find a location, just as lovely, but with a few more bathrooms? We would have appreciated the change to remedy this problem, if it had been brought to our attention during your visit. We are happy that you enjoyed your time here despite the weather. We hope you would give us another chance to wow you, and consider booking with us again. We do offer a returning guest discount. And again, thank you so much for booking with Gibson Beach Rentals. Great location on the beach; condo very clean. We love our location as well and thing this unit is great too! We are so happy that you had a 5 STAR stay with us! We love to hear that we made a good impression on a first time guest. Please keep in mind that all returning guest are eligible for a returning guest discount. I truly love this condo. Whenever I'm in Destin this is my first location I try to book. Nothing else compares to Beachside II 4359. If it's booked and I have to book another condo, I don't enjoy my stay as much!! Did not want to leave but had to get back to reality! We love that we can be your break from reality. We also love that you have the unit that best fits your needs! We hope that we keep on providing you with 5 star stays! Don't forget your returning guest discounts in the future. This is our second stay in Beachside II unit 4359. Again, it was a wonderful get away. We couldn’t ask for a better place to call Home in Destin. The beach view is unbelievable and the condo is comfortable, clean and well supplied. The beds are comfortable, decor relaxing after a beach or shopping day, quiet and convenient. Couldn’t ask for more. To add even more, the dolphins came and played off the beach daily. Thank you for another wonderful stay. What a gorgeous photo!! Thanks for sharing with us. Truth be told ... watching dolphins play is our favorite pass-time too. We are thrilled y'all loved the condo and that it's your home-away-from-home. We appreciate the amazing review and can't wait for your family to join us again soon. Awesome Annie! Thanks so much! We're thrilled y'all loved the condo. We'd love to have you back again any time! Be sure to mention our repeat guest discount on your next visit. We are regulars with Gibson Beach Rentals. Our stay this year was SUPER AMAZING!! The property was very comfortable and accommodating for our family of 6. The service was impeccable! The highlight for all of us were the free activities with the Xplorie program. We didn’t realize the value until we actually used the card. I was able to scratch something off my bucket list using the card, my children had their firsts using the card!! I could go on and about this experience but I’ll just say you should try it for yourself!! No regrets nothing but total rejoice in our 7 day stay!! Wow Wow Wow!! Y'all had a wonderful vacation and we couldn't be more excited. We really appreciate the fabulous review and appreciate you, our loyal, amazing guests. We look forward to your next visit and hope the rest of your summer is wonderful.